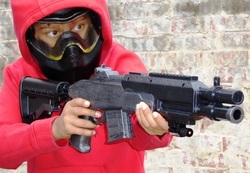 ​mobile low impact paintball- Perfect for your next birthday party ages 7 to 70! If you’re in the Dallas / Fort Worth area we bring the kids paintball party fun to you! This is not regular paintball, our special customized guns come complete with SWAT style laser sights, (great for evening games) are light weight, spring loaded and shoot smaller paintballs at about half the speed as regular paintball, you can actually watch the paintball go through the air-and splat on your target and it doesn't hurt like regular paintball. The guns have about a 100 foot range and are very accurate up to 40 feet. Not just for kids birthday parties, teenage boys, girls and adults all have a blast as well, sometimes our toughest job is getting the gun back from dad! Not just for Birthday Parties Great for Sports Teams, Youth Groups etc. We provide and set up everything needed for a truly memorable experience including, host/referee, safety masks/goggles, vests, and barriers. All you need is a 50' x 30' area (or more). The paintballs are water soluble and 100% biodegradable and clean up is quick and easy with a garden hose . It is recommended that players wear clothes able to get a little dirty. ​So, check out the rest of our website, share it with your friends and when you are ready to create some truly great family memories and have the best paintball party fun ever go ahead and book a party with us. Available in Plano, McKinney, Allen, Frisco, Prosper, Celina, Little Elm, Coppell, Addison, Carrollton, Richardson, Princeton, Melissa, Anna, Van Alstyne, Aubrey, Parker, Lucas, Fairview, The Colony, Lewisville, Murphy, Wylie, Dallas, Fort Worth, Arlington, Rockwall, Rowlett, Flower Mound, Keller, Southlake, Westlake, Irving, Denton, Sherman and surrounds.